Size of Male: 80-143 lbs., 26-30 in. Size of Female: 80-143 lbs., 26-28 in. The Black Russian Terrier is a large, robust and powerful dog that was created in the 20th century as a guard and protection dog for the Soviet armed services. It is said that a well-bred Black Russian Terrier that is also well-socialized is a loving dog with his family, though he will be reserved toward strangers. They love children and usually get along well with other pets, though they can display some dog-dog aggression among males. This is a very intelligent breed and they do best if they have good dog training and socialization. They require an owner who will stay in charge and they need lots of attention from their family. In the 1940s the Soviet Union’s state kennel, the Red Star Kennel, began breeding to create a dog for its armed forces. They needed a dog that could do military and guard work and withstand the country’s climate. They used Giant Schnauzers, Rottweilers, Airedales Terriers, Russian Water Dogs and others. In breeding, they used the best dogs available. They achieved what they were looking for in character and temperament but the dogs were variable in type. Later, the appearance of the breed was standardized by other breeders. 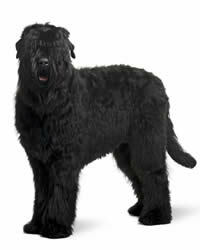 Also known as the Black Terrier, this breed is a large, strong dog without pretention that requires minimal coat care. Black Terriers are more than capable of working as guard and protection dogs. They are is very intelligent and very easy to train. They also have a certain degree of aggression needed for their work. The Black Russian Terrier is loyal and devoted to his family. These dogs are calm and confident, courageous and self-assured. They are very intelligent and they can adapt well to most kinds of dog training. This dog breed has strong protective instincts that usually develop by the time the dog is about a year old. They are usually aloof to strangers and they are alert and responsive so they will be on guard at your home. These dogs do love children and they will be protective toward them. It’s important that a Black Terrier receives good early socialization and training so you will be fully in control of them when they become more protective – and full-sized – as an adult dog. They typically get along well with other pets in the household but they can show dog-dog aggression to other male dogs. Living Environment – The Black Russian Terrier can adapt to living in an apartment. They are not very active indoors and are happy as long as they are close to their people. They will only enjoy a yard as long as you are outside with them. Although they are very large dogs and need daily exercise, they prefer to be with people at all times. They do not do well in a kennel situation at all. They will be very unhappy is separated from their family. Grooming – The Black Terrier needs regular weekly brushing. You need to remove hair from the ear canals and trim hair between the paws. Otherwise, these dogs only need to be trimmed a few times per year to stay looking good. They shed very little. Diet & Exercise – Dietary requirements are considered normal, but they are large dogs with a big appetite. These dogs do need plenty of daily exercise and they enjoy cold weather. Health – The Black Terrier can be prone to canine hip dysplasia and elbow dysplasia. Progressive retinal atrophy (PRA) can also be a problem. Ear infections are also a problem in the breed, so be sure you clean their ears regularly. If you are interested in this dog breed you should talk to a breeder about possible dog health problems. Black Russian Terriers are very intelligent dogs and they are very trainable. Early training and socialization are recommended for this dog breed. They have been trained for police work, military duties, guard and protection work. You do need to be firmly in command when training your Black Terrier. These dogs respond well to positive dog training (praise, rewards).